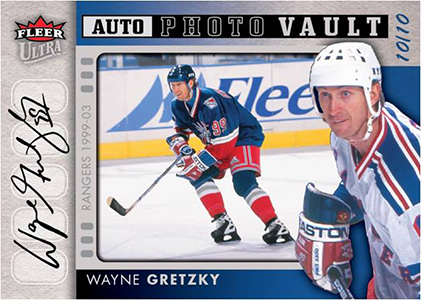 With 2014-15 Fleer Ultra Hockey, Upper Deck continues to use the Fleer name to emphasize nostalgia and inserts over autographs and memorabilia hits. While boxes deliver several inserts, signatures and jerseys aren't among what's promised. Rather, it's about different designs and technologies. 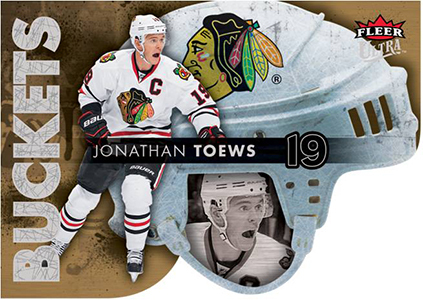 The 2014-15 Fleer Ultra Hockey base set has 200 cards. Parallels are a couple of familiar names for those who collected Ultra in the past. Gold Medallion cards land 1:2 packs. Platinum Medallion average one per hobby box and are numbered to 99. Because the product releases prior to the start of the new season, it limits the number of rookies it can have. Enter the Rookie Redemptions, which will be good for players debuting during the 2014-15 season. Like the base set, there are Gold Medallion (1:96 packs) and Platinum Medallion (#/25) parallels. 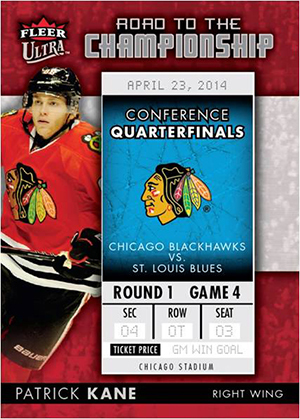 The 2013-14 NHL postseason is showcased in Road to the Championship. Landing one per hobby box, the cards include a replica playoff ticket. Every game, from the first match-up of the round of 16 through the last game of the Stanley Cup Finals is featured. Each round acts as a different tier. Conference Quarterfinals are the most common, landing 1:35 packs. Other levels are Conference Semifinals (1:58 packs), Conference Finals (1:164), and Stanley Cup Finals (1:300). Photo Vault Film Slides (1:48 packs) come with images that have never been used before. They come from the Upper Deck vault and include players from multiple generations. Autographed versions are numbered to 10. National Heroes come with a satin mini flag embedded in them. The checklist includes 40 total players from Canada (1:60), USA (1:150), Russia (1:225), Sweden (1:360) and Finland (1:360). Signed versions (#/25) are also randomly inserted. Every 2014-15 Fleer Ultra Hockey hobby box comes with four basic inserts that are die-cut on rainbow foil stock. Buckets are the easiest to find, landing 1:9 packs. Others include Gongshow Grinders (1:18), New View (1:36), Premier Pad Men (1:54) and Rule 76 (1:108). Other than signed versions of pre-existing inserts, additional autographs can be found in Fresh Ink Signatures (1:120). 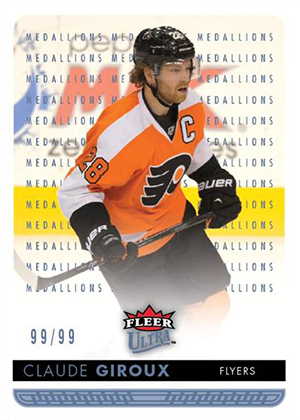 Every third box of 2014-15 Fleer Ultra Hockey comes with an EX bonus pack. They come with two base cards and one of the following: Legends (#/299), Phenoms (#/249), Essential Credentials, Future, Essential Credentials, Now, and Jambalaya (1:112). For odds, h = hobby packs, r = retail packs, b = blaster packs. 200 cards. Shop for sets on eBay. Unannounced. View a detailed guide and gallery. 2 per bonus EX pack. Randomly inserted in bonus EX packs. Good: Daring configuration, creative inserts, clean base set. Bad: Base design is nice but it doesn’t feel like “Ultra,” release price feels a little high. 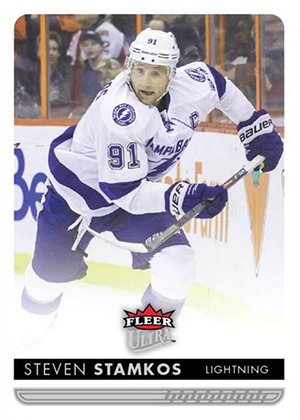 The Bottom Line: 2014-15 Fleer Ultra Hockey is nostalgic in some regards but it’s definitely not reliant on the past. Bringing a configuration that stresses inserts over hits, it’s an intriguing product. But it might be a little too ambitious at this point given the price. Ultra has some really cool looking inserts. And that’s important because they’re the big driver of the product. They harken back to a time in the hobby when inserts were pretty much all collectors had as far as chase cards went except for some ultra-rare autographs and, eventually, memorabilia cards. A little bit strange, a little bit shiny and very distinct, all of the basic inserts in 2014-15 Fleer Ultra Hockey have a lot of personality. Road to the Championship is risky as one of the key box hits because it’s easy to compare them to the Rookie Ticket Autographs that Panini Contenders has. However, these are some of the best designed cards in the product. Even though they’re clearly not real tickets, they have the look of something special. It’s the type of card I’m happy to pull and add to my personal collection even if I have no intention of undertaking the set. I did find the National Heroes flag cards to be a bit of a disappointment. At a glance, they look okay, but they would have been much better with a more textured flag like a manufactured patch. The thin canvas or screen print doesn’t pop much and doesn’t justify the cut out window. The base set is nice but it doesn’t scream the “Ultra” of old. The big reason is the border. Ultra was one of those sets where full-bleed photography played a major role. Here, the cards have fairly thick white borders. I can’t speak for Upper Deck’s decision to go this route, but one logical reason (if this was a consideration) is Upper Deck’s flagship Series 1 and Series 2 set uses a slick full-bleed look. Having two similar sets so close together might not be the best idea. Basically, the base cards are solid but just not like they were 20 years ago. From the time it was first announced, Ultra intrigued me. The lack of hits was refreshing as long as the variety of inserts could make up for it. It’s something different. And in those regards, it succeeds fairly well. By using inserts over autographs and memorabilia, there are better opportunities as far as player selection goes. The inserts do a good job of appealing to a broad mix of collectors as well. Some are relatively easy to finish. Others are a challenge but offer a lot for team collectors. This is something Upper Deck often does well with. It targets with a focus but adds enough outside that target to make it appealing to a broader base. The limited rookies on the checklist are to be expected given its early release. Even with the Rookie Redemptions, this hurts in some regards. Although not overly expensive, Ultra seems a little high right now for what it delivers. It’s a big shift to drop the memorabilia and autographs as a promised box hit given the price of a box. And while the inserts are, for the most part great, they don’t quite reach a level where they feel like they’re replacing a hit. To do this, I think one or two of the inserts need to be take up a notch and deliver something that isn’t common in the hobby. As it stands, there are some nice added pieces that help a lot like the randomly inserted EX packs. The unannounced variations aren’t commanding a ton of attention, but if you look at them as something extra, they’re a bit of added fun. Variations are overdone now, but by sticking with an outdoor game theme, they’re a nice reminder specific to last season. As expected, 2014-15 Fleer Ultra Hockey is a different sort of break. And that’s a good thing. It acknowledges, even if indirectly, that memorabilia and autographs are overdone. Ultra goes with something different. It’s creative but hopefully it (and other products) can go further in the future. I hope there’s a place in today’s hobby for products like this where great cards are not defined by a swatch of clothing or a signature. It can also be stuff that stresses originality and breaking the status quo. So this stuff want worth while to produce when there was competition with Panini, but now it is I guess. Upper Deck is going back wards, instead trying to progress card collecting. Ultra was exactly where it belonged in Showcase (product of the year so far in my opinion….guess Upper Deck didn’t want to stock with oneof the few great products they havemade inthe past 3 years) as secondary hits with only rookies and jambalaya cards (only cards in the set people care about). Not to mention there will be no good rookies besides the redemptions that collectors will receive after the young guns are out and nobody will care about them any more. I’m sure Upper Deck will have more unoriginal rehashed products to come. I hope this product is $40, or it probably will be two weeks after it cones out. They look terrific. I am very curious on the first box brakes. More UD junk for 14-15….should be about a year before we see anything good.. I really liked these – granted, I got a really good box. Auto, flag, platinum medallion, ticket, rookie redemption. I will be putting a set together – that’s how much I like these cards. I like this product, the quality of the card, yep really. Pull out Jambalaya of Carey Price first box, rookie redemption # 4. Love the color. More than Trilogy – lot more than SPX and the series 1 and 2. For all the people who call it junk remember one thing: you can’t always pull the jack pot for 40$ see what happens in 91-92. Instead of sending crap buy The Cup. National Treasures, Dominion. Thick cards worth the 400$+++ And if you love the hobby collect the cards to complete set, trade and wish for a big pull sometimes! : )!!!! I bought two hobby boxes today and came out like a bandit. In one box I got two Canadian National Heroes, one of then being an auto card. In the same box I got two rookie redemptions (#17 and #24). The other box I got the bonus pack which had Crosby, Overchkin and a Sakic /299. Got a Paltinum Skinner 53/99, Premier Pad Men of Crawford, Photo Vault of Brett Hull and rookie redemption #25. And. gold medallions of Subban, Ovechkin and Eberle. This is a fun product with tons of hits. Love this product! The photo vault inserts are my favorite. Very nice looking inserts all around. As a child, I would have been mezmorized by the shinny die cuts. Hunting through the base to find the outdoor variations in comparable to finding secrets in super mario bros 3. An extra kick at finding something special. I like the rookie redemption cards, it just prolongs the fun. I highly recommend fleer ultra for first timers or vets, i regret selling off my early box hits, wish I would have kept for collection. At first glance I did not like this set at all. The “lack of hits” and white bordered base cards (I’ve always remembered ultra being border-less), just didn’t really do much to excite me. However, add the wife and kids at the dining room table with a fresh box and now I see how great this product is. The kids LOVE the shiny Buckets and Gongshow cards. My wife and I are chasing the ticket cards from our favorite team and flag cards of our boys in the Red, White and Blue. I think the key to this set is to, wait for it…..HAVE FUN! You probably won’t make your money back with a box of this product, but with the right expectations it is FANTASTIC! I have two different Drew Doughty cards, yet I don’t see any mention of an alternate print. Both are numbered #85. There doesn’t appear to be any difference between the cards, except for the pictures on the card; one has a home black jersey and one has a grey jersey (taken during the Stadium Series game). It was on the “More Info” tab, but I added a listing on the main checklist as well. Thanks for the information. Just a note, though; the one short print is for #87 Jeff Carter, not #86 Anze Kopitar. Or is there one for him too? Paul � I don’t quite follow what you are asking. I thought you were talking about Doughty originally. There is a variation for Kopitar and he is shown on the checklist but I don’t see anything for Jeff Carter.